Whoever came up with the idea of Gizdodo is a legend! I so much love dodo but I have never thought of creating a master piece with it. 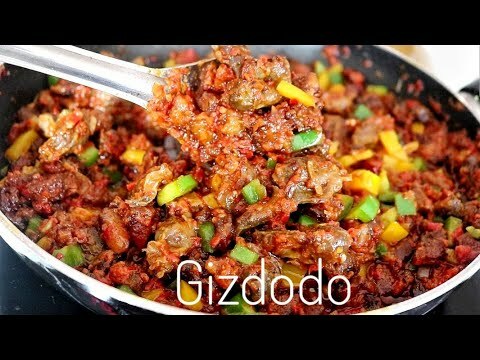 Gizdodo is a simple side dish that is usually served with rice (especially Jollof rice). From the name alone, you can already tell that it is a combination of plantain and gizzard. Today, we would be talking about the art of making this legendary meal! If you do not know how to make it, you are in the right place! Peel off the back of the plantain and chop them into smaller bits with a kitchen knife. Blend the red bell pepper and some onions. Wash the gizzards with hot water and precook for 20 minutes. Add seasoning to taste. Fry the plantain with vegetable oil until it turn golden, scoop into a sieve and allow it to sit for a while. Then fry the chopped gizzard with the same oil. The gizzard would be dark-brown when it is properly fried. Remove and add a teaspoon of palm oil to the pan. Add some chopped onions and stir. When the onions has fried, add your blended pepper and add your maggi and salt. Stir the soup to avoid it from burning. Once the pepper is properly fried, you are almost done with making gizdodo. Add the fried gizzards, plantain and sliced green peppers. Stir all together, cover and allow to simmer for 3 minutes. That is just how to make gizdodo. How Do I Calculate My Menstrual Cycle?